Today, October 9, is the feast day of Blessed John Henry Newman, beatified on September 19, 2010, by Pope Emeritus Benedict XVI in Birmingham, England. On that day the pope, who appreciated the intellectual greatness of Newman, chose instead to speak of his charity. He was indeed a towering intellect who lived with the charity of Christ. Newman has yet to be declared a saint, a procedure oddly called “canonization,” although we could well say that it is like a cannonade that rightly resounds throughout the world. We can be sure that he will be numbered among the saints, and some future pope will later declare him a Doctor of the Church because of the clarity of his teachings which stand out for the faithful. Newman was a modern day Father of the Church, one of those rare men whose theological learning spanned the great spectrum of theology: Sacred Scripture, dogma, history, liturgy and morality. His learning and teachings went hand in hand with holiness of life. Today the Church declares such persons Doctors, reserving the term Fathers for those who lived roughly in the first millennium, and now including women, also outstanding in their teaching and holy lives. Each Doctor of the Church is typically known for one contribution or another, and receives the appropriate moniker. It is possible that Newman will become known as Doctor of Conscience for his exposition of the role of conscience in the moral life and the defense of a Christian’s convictions in public life. He may also become known as Doctor of Development in Doctrine for his work in the study of how authentic doctrine develops in continuity with earlier tradition; and perhaps also as Doctor of Friendship, for, in his close to ninety years of life, he had such a rich experience of friendship with people, both men and women, in all walks of life. In a world with so many means of communication, many people are alone with few or no friends. In the doctrinal and moral confusion of our times, and amid news of immoral behavior of clergy as well as abuse of power by bishops, we need to turn to luminous examples of holiness and clear exponents of the doctrinal and liturgical Traditions of the Church. Newman is one such example for our times who can strengthen our faith in Christ and the Church. The Fathers and Doctors of the Church are not statutes in a museum. They are meant to be our teachers in the faith, our guides in Christian life, and our friends. John Henry Newman was full of warmth and kindness, and concern for the sick and the troubled. His feast day is an invitation to get to know him or to deepen our dealings with him. A friend told me last night that he had just read St. Francis de Sales and thought of starting to read something about by Blessed Newman, and, lo and behold, he did not realize that today is his feast day. So you might decide to read a biography about him, and to enjoy some of his sermons and prayers … to get to know him, and to ask him for his help from heaven. 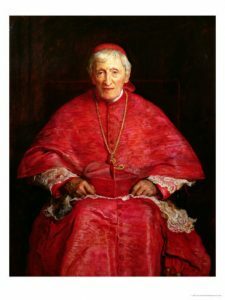 As St. Josemaría Escrivá wrote, ”these world crises are crises of saints.” John Henry Newman was such a saint for 19th century England. But his teachings and life and example invite us to follow Christ more closely today. A gift to begin to know him!